I have noticed a few common patterns being used throughout my contracting career, so i have decided to make a simple template framework which masks all the hard work with networking. I will continue to add to this library to make it a very handy toolkit to use. The idea of the framework is for people to fork a version and then customise it for their individual usage. Its still a work in progress and I’m hoping to use it in my other projects too. Well i have been so busy over the last year working with startups in London, so my apologies for not updating sooner. I have been looking for a new contracting role recently, and i have seen so many roles that require TDD and I know that these companies are just using it because it’s the current buzz word in tech. I would argue that BDD and TDD both have their own place, I have been a keen advocate to say that interfacing platforms, e.g. iOS, Web, Android, etc should be BDD because the user interacts with their behaviour, not programmatically or mathematically. In addition to this, the interface is forever evolving so the cost of refactoring a TDD interface is significantly higher than a BDD interface. In my opinion TDD should be used for the API layer where most of the business logic will exist, this logic usually won’t change once its established and everything created in the API should have unit tests. For the interface, that’s why UI Unit tests exist e.g. selenium, calabash, ui unit tests(Xcode), so if your interface does have some business logic, then yes write a unit test, but there is no need to have the whole app written in a TDD way! I think the lack of understanding of TDD and BDD is a problem for businesses right now, they should be relying on their tech lead & architect to determine where and when to use the correct methodologies. A great real world example is a company who will remain unnamed, a friend of mine mentioned they are looking for permanent staff who can develop in a TDD environment and use a specific tool/framework! I found it laughable that they have such requirements, clearly the person who is in charge of hiring employees is blind sighted to thought that you can find a permanent TDD developer who can write in this framework. What they really should do is re-evaluate their current infrastructure, determine where to use TDD and BDD, re-organise current employees and then look at hiring the correct personnel. If they need a TDD developer, then hire a TDD developer but don’t put the requirement that they must have experience with a particular framework, there is frameworks popping up left right and centre and the current framework they are using is probably out of date already in the first place! We have all been there, getting a crash report and the stack trace makes no sense because its not been symbolicated properly. I found this really handy tutorial that goes through every step to symbolicate manually instead of relying on the “magic” to happen. The blog post goes into a good level of depth on how it works and how to do it yourself. I have uploaded my ipa assets project to github publicly so that anybody can use it. IPA-Assets allows you open an ipa file from the app store and get the images from it, it can be quite a handy tool when you want to understand how other apps work with their assets. I have been really busy working on a few contracts this past year and I have started to get a good grasp on how the market is moving. An interesting subject is digital communications with businesses, its now becoming a fast trend within the mobile market for apps to allow users communicate with businesses. I predict there will be a flurry of apps which will provide a service where you type in a message to the business, somebody on the other end gets the message and contacts the business and relays that information. 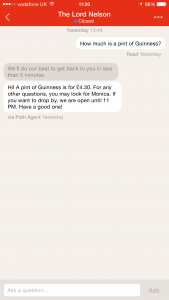 There is already a few apps trying this, namely Path Find, it allows you to send a message to a business and they will relay that information back, at the moment they are covering bars and restaurants. 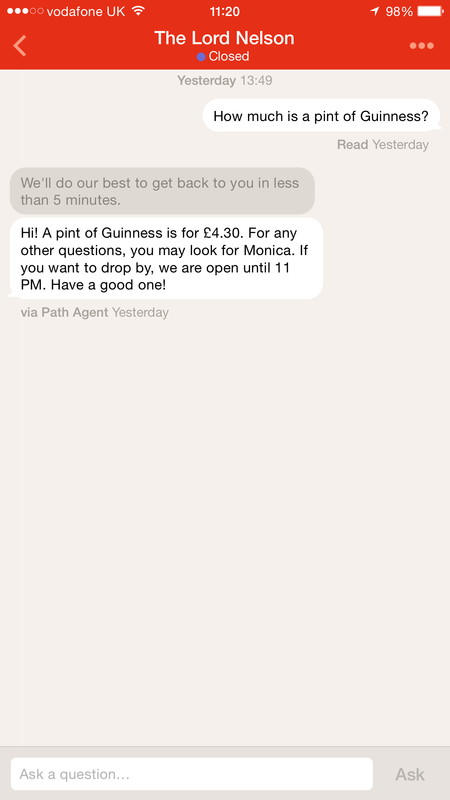 Here is a screenshot of me trying out their service. So really, its just a matter of time until you will have true unity and all apps will allow you to “chat” with the business digitally. If you haven’t had chance, you should watch Facebook’s keynote at F8, the new update to the messenger app allows you interact with a business when you make an order, so you can amend your order and even get its delivery status. Facebook are looking into payments via the messenger app, so this process is going to be very seamless, from start to finish using the messenger app. You can download a range of items to enhance your experience with Xcode, from Themes to plugins. I found that although Xcode is an excellent IDE, after using Android Studio(essentially Inteli-J), there is some items lacking. Alcatraz has a range of plugins which address some of these issues. CocoaPodsUI – A CocoaPods UI, to save me having to navigate to the project directory and perform an update. DBSmartPanels – Automatically hides the panel when not in use, I find that you lose alot of screen real estate when you have all the panels open, this plugin will auto hide it when you switch views from an interface file to a code file. FuzzyAutocomplete – Why have Apple not done this already!? Simple plugin which applies fuzzy matching when showing autocomplete. RTImageAssets – Since the release of the iphone 6+, most apps should have @3x images, this means additional time in photoshop having to produce the images in an additional resolution, this plugin makes life alot easier, I only have to make the image in the @3x resolution, then get the RTImageAssets to generate the other resolutions. Wow and another great release from the Facebook engineering team, this little tool is an excellent addition to the lldb tool. pviews Print the recursive view description for the key window. pvc Print the recursive view controller description for the key window. visualize Open a UIImage, CGImageRef, UIView, or CALayer in Preview.app on your Mac. fv Find a view in the hierarchy whose class name matches the provided regex. fvc Find a view controller in the hierarchy whose class name matches the provided regex. show/hide Show or hide the given view or layer. You don’t even have to continue the process to see the changes! mask/unmask Overlay a view or layer with a transparent rectangle to visualize where it is. border/unborder Add a border to a view or layer to visualize where it is. bmessage Set a symbolic breakpoint on the method of a class or the method of an instance without worrying which class in the hierarchy actually implements the method. wivar Set a watchpoint on an instance variable of an object. presponder Print the responder chain starting from the given object. These tools are really handy, especially if you are battling with Autolayout problems, clearly somebody at Facebook was having problems and decided to make a tool to make life easier, well thanks, its a really good idea! Then you just need to add a .lldbinit file to your home directory, essentially this is like you .bash_profile, but for xcode/lldb. So this is how i did it. Then restart xcode and it should work straight out the box. As a senior developer at Immediate Media, I managed a team of 3 developers and 2 QA’s whilst also mentoring a junior developer. I was fully involved from start to finish with the RadioTimes DiscoverTV for iPad, successfully achieving a top 100 ranking in the Apple app store and winning several design awards. DiscoverTV is an TV listings grid with media recommendations, essentially the application has two functions, one to allow the user to find out whats on tv now, and the other to give suggestions on what to watch. Swift sounds exactly what objective-c has been missing and all of the other competing programming languages have supported. I cant wait to get my hands on it and have a play, also there is a ibook available from apple which goes into detail about Swift. Facebook have just released a cool little library which has all the cool little animations that they are using in the Pages app. There has been some really good releases from facebook recently, hats off to them. Try them both, all pretty cool and give your app that special feel to it.